This Assignment of Domain Name Contract is included in editable Word format that can be customized in Word or by using the included Wizard software. 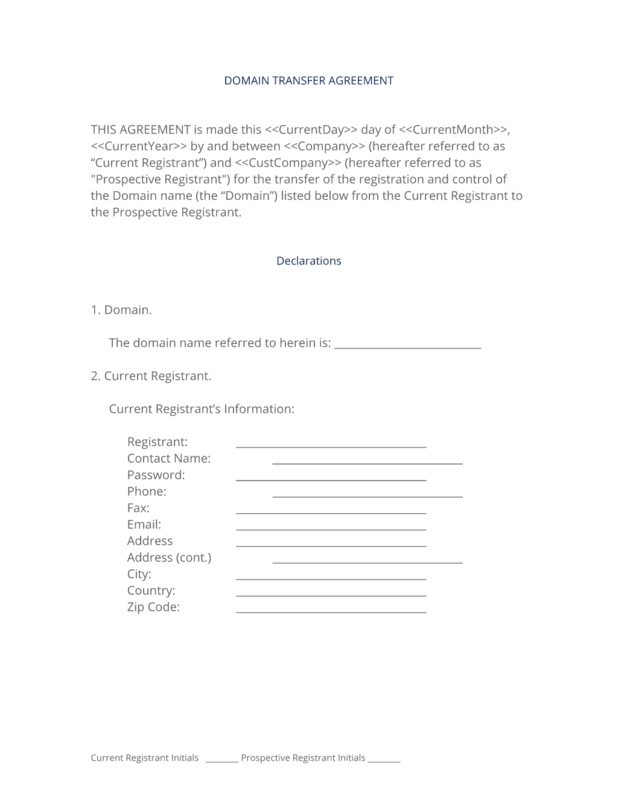 THIS AGREEMENT is made this Current Day day of Current Month, Current Year by and between Company Name (hereafter referred to as "Current Registrant") and Company Name (hereafter referred to as "Prospective Registrant") for the transfer of the registration and control of the Domain name (the "Domain") listed below from the Current Registrant to the Prospective Registrant. That it is either an identifiable individual over 18 years or age or a legally recognized entity, partnership, LLC or PLC. that it is not bound by any outstanding contract or commitment which requires prior approval of the assignment thereof of any outside or third party. That it has clear, good and marketable title to the domain name and clear of any and all claims, liens, encumbrances and security interests whatsoever. The Current Registrant understands that by signing this agreement that they will relinquish control over the Domain to the Prospective Registrant and that the domain will become disassociated from any and all web addresses, nameservers, URLs, webservers and other locations designations set up and maintained by the Current Registrant. The Current Registrant shall indemnify and hold Prospective Registrant harmless from and against any and all claims, judgments, awards, costs, expenses, damages and liabilities (including reasonable attorney fees) of whatsoever kind and nature that may be asserted, granted or imposed against Prospective Registrant directly or indirectly arising from or in connection with the transfer of "Domain" and any prior services, contracts or the any unauthorized representations made by Current Registrant or any breach of this agreement by the Current Registrant. Neither party shall be held responsible for delay or failure in performance here under caused by, acts of nature, strikes, embargoes, fires, war or other causes beyond their reasonable control. If any provision of this agreement is held to be unenforceable, the enforceability of the remaining provisions shall in no way be affected or impaired thereby. This agreement and any disputes arising here under shall be governed by the laws of State, without regard to conflicts of laws principles. A failure by any party to exercise or delay in exercising a right or power conferred upon it in this agreement shall not operate as a waiver of any such right or power. The complete Assignment of Domain Name Contract - with the actual formatting and layout - is available in this Contract Pack.